Along College Hill’s Keene Street, identical teal blue signs placed in nearly every yard point to a street united. Unlike other neighborhoods in Providence, this group of residents does not rally against natural gas terminals, Immigrant and Customs Enforcement, or the threat of eminent domain. Their concern, touted by the signs that read “Save Neighborhoods: Enforce Zoning Laws,” is overcrowded student apartments. “This neighborhood is pretty much under assault right now,” Deborah Simmons* told the College Hill Independent, standing in front of her Keene Street home. A block to the south, Simmons’ neighbor on Lloyd Avenue echoed her concerns. “We’re always fighting this battle of more people stuffed in smaller places. It becomes an Animal House situation,” he told the Independent, pointing towards the pile of trash sitting outside of a student house—a smelly blemish on the otherwise litter-free block. On Keene Street, the epicenters of neighborhood concern are numbers 77 and 85, two elegant clapboard houses owned by Walter Bronhard, a landlord who made Providence headlines when he bought, neglected, and threatened to demolish the Welcome Arnold House, a historic property off of Benefit Street. Keene Street’s anxieties, though, are only in part due to the question of historic preservation. “We’d like the character of the neighborhood to be preserved,” another resident told the Indy. That vague notion of “neighborhood character” accounts for many of the Keene Street neighbors’ ruffled feathers. On this block, houses that proudly adorn Providence Preservation Society placards above Munroe Dairy boxes consistently sell for $500,000-800,000. And although residents are clear that the proximity of their homes to Brown University drew them to the neighborhood (Deborah Simmons, for one, invokes the classic college town rejoinder: we love going to lectures! ), the proposition of this notorious landlord setting up shop on their block was too close for comfort. 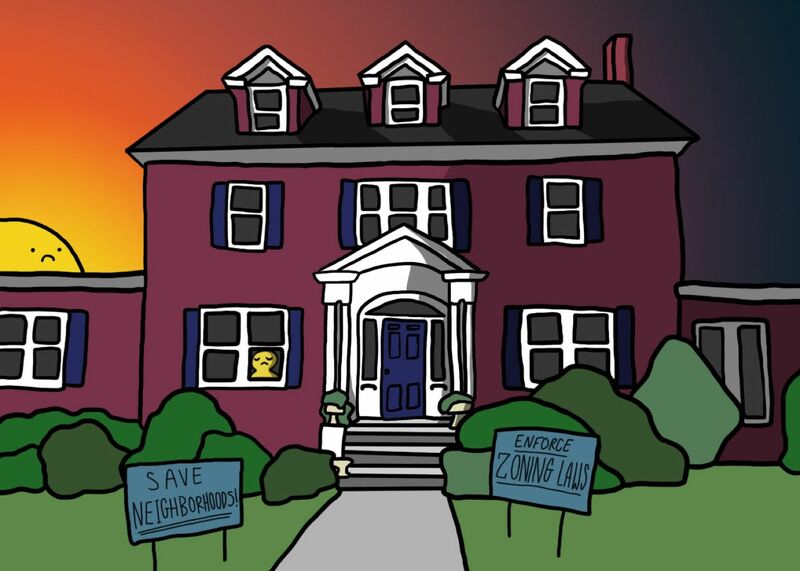 At the heart of these conflicts, as the yard signs allude, are two contentious parts of the Providence zoning ordinances that can be applied to restrict student apartments. One rule explicitly prohibits more than three “college students” from living together in single-family homes on blocks zoned as single family residential neighborhoods, as Keene is. While originally intended to limit the encroachment of student housing into a single family area near Providence College, Bob Azar, Deputy Director of the Providence Planning and Development, told the Independent that this section does not in fact apply to Bronard’s properties on Keene Street. While those houses have been used as owner-occupied single-family homes “for generations,” as Samantha Barnes (name changed upon request), who lives on Keene Street, wrote in an email to the Independent, they’re officially considered two-family homes. The two properties, according to Barnes, have “in-law apartments” in the attic, and thus were grandfathered into the current zoning code as two family homes. Figuring out why the city might not actually enforce the law, however, becomes more complicated and relies on recent state court decisions. In an effort to protect students’ rights, the Rhode Island chapter of the American Civil Liberties Union has challenged both the “unrelated persons” and “college student” types of laws, arguing that they violate the the equal protection clause of the Rhode Island constitution. The City of Providence, under current Mayor Jorge Elorza, successfully defended the “college students” ordinance in Superior Court just this year, convincing the court that college students are not a “protected class,” like race, ethnicity, or national origin. City Councilperson Seth Yurdin of Ward 1—an area that includes the Fox Point neighborhood and, in turn, many student apartments—might have an explanation for the neglect that Keene Street residents are feeling. He opposes ordinances that would further restrict student apartments because unruly student houses “are the exception and not the rule.” “If there are specific problem properties,” he told the Independent, “there are ways for the City to look at those,” such as enforcing rules against noise or piles of trash. Yurdin gestures, it seems, towards the idea that neighbors can solve some problems amongst themselves, and, if needed, call the City for help. Perhaps a meaningful solution to these problems, then, is bolstering city enforcement of specific nuisances since, according to Councilman Yurdin, the City struggles to staff sufficient enforcement officials. If the City works towards adequately addressing problems as they come up, they can leave the vast majority of quiet students alone. While Councilman Yurdin suggests that neighbors take up student-related issues with each other (and with City enforcement when needed), Keene Streeters are adamant that their problem will only be solved with zoning-based change. Given the demographics of Keene Street, it seems that this group of neighbors has taken such a systematic approach to problem-solving simply because it can. Unlike so many low-income communities being actively displaced, the Keene Street residents have ample tools to engage City government and apprehend a neighborhood in flux—even if it’s a very different kind of flux. As multiple College Hill residents admitted, they spent hours on the phone with public officials or testifying to city council members. Perhaps most revelatory of the resources at Keene Street’s fingertips is their private lawyer. They have time and money and bright blue signs, but in practice, these resources do more to draw attention away from Providence’s fundamental housing deficiency than they do to create reasonable solutions to the city’s most pressing issues. Indeed, at the same time home-owning College Hill residents worry about the potential for their neighborhood’s ‘character’ to change, renters on the South Side, West End, and Olneyville are being priced out with little interference from the City. And while the Keene Street tale of a hockey house party a few years back is enough to warrant a headache, in the scheme of Providence’s housing woes, it’s small potatoes. maybe broke up a source’s 30-year-long marriage while writing this story.